The military does not advertise what it is doing in public schools. But for the past four years, we have been researching those who make it their business to closely monitor the actions of military personnel in schools: parents, students, military veterans, and citizens affiliated with the grassroots "counter recruitment" movement. Many of them told us that state education commissioners, district superintendents, school principals, and other policymakers react with surprise at their efforts to rid schools of the undue influence of military personnel. In fact, most public officials are unaware of the extent of the military's presence in education settings and the ways in which the Pentagon can access private data about high school students. Until now, there has been a lack of hard data describing the extent of military involvement in schools. Last year, in response to a Freedom of Information Act request, the U.S. Army provided us with documents about recruiter activities in Connecticut high schools during the 2011-12 academic year. 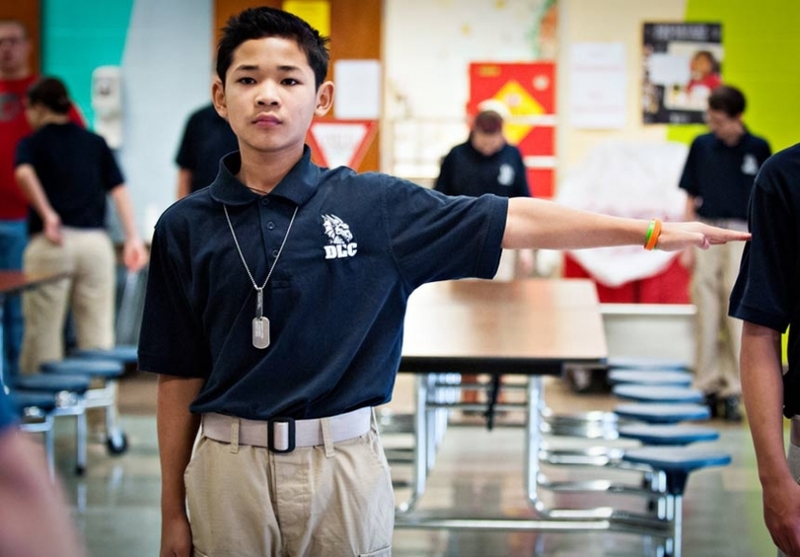 Middle school military programs are younger cousins of the Junior Reserve Officers’ Training Corps (JROTC), a Pentagon program taught by retired military officers and present in more than 3,500 high schools nationwide. Although there are strong similarities with JROTC— military-style uniforms, close-order drills, a curriculum that emphasizes patriotism and military history—the key difference is that JROTC is supported by federal funds and middle school military programs are not, by federal law. That means the continued existence of the middle school programs depends on state or district funding and, in some cases, charitable contributions. Although the localized nature of the programs and the variety of names they go by—most commonly “leadership corps” or “cadet corps”—make them difficult to quantify, a review of programs by In These Times in more than a dozen states found that there are at least 97 public middle schools currently offering military-style education. The United States is one of the only developed countries to allow a military presence in public schools, including an active role for military recruiters. In order to enlist 250,000 new recruits every year, the US military must market itself to youth by integrating itself into schools through programs such as JROTC (Junior Reserve Officers' Training Corps), and spend billions of dollars annually on recruitment activities. This militarization of educational space has spawned a little-noticed grassroots resistance: the small, but sophisticated, "counter-recruitment" movement. This book describes the various tactics used in counter-recruitment, drawing from the words of activists and case studies of successful organizing and advocacy. Counter-recruiters visit schools to challenge recruiters' messages with information on non-military career options; activists work to make it harder for the military to operate in public schools; they conduct lobbying campaigns for policies that protect students' private information from military recruiters; and, counter-recruiters mentor youth to become involved in these activities. While attracting little attention, counter-recruitment has nonetheless been described as "the military recruiter's greatest obstacle" by a Marine Corps official. 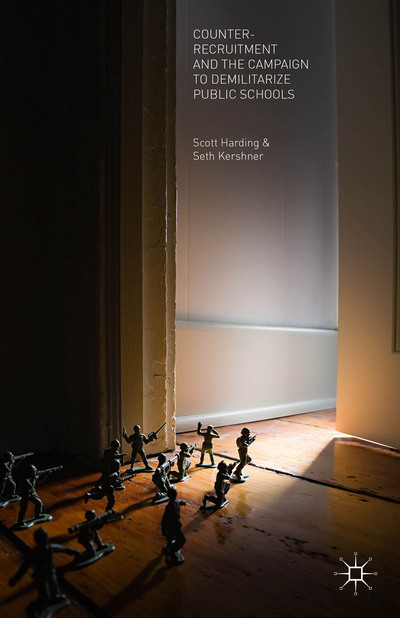 Scott Harding is Associate Professor and Associate Dean for Academic Affairs at the School of Social Work, University of Connecticut, USA. He has extensive advocacy and organizing experience on issues of homelessness, affordable housing, welfare, community development, and transnational labor solidarity. He was Executive Director and Policy Coordinator for the California Homeless & Housing Coalition, USA. He is a Board Member of Integrated Refugee and Immigrant Services (IRIS), and former Editor of The Journal of Community Practice. Seth Kershner is an independent writer and researcher whose primary focus is the US military's growing presence in public schools. His work has appeared in a number of academic journals and books, as well as popular outlets such as In These Times, Rethinking Schools, and Sojourners, among others. Kershner currently works as a reference librarian at Northwestern Connecticut Community College, USA.